I used docrafts lovely new collection of papers called Eau de Nil it's such a soft bluey - green, I used navy as a contrast. Marianne dies are so lovely to use, I love the delicate lacey effect. I made my flowers from mulberry paper and added butterflies... my things with wings. I do love butterflies on my cards, sometimes I find them very useful to cover up a mistake or thumbprint which magically appears just as I am finishing a card so if you see a random butterfly on one of my cards you know why. So there it is I decided to make this for my Sister in Law's birthday as I know she loves these colours, I need to find my Mojo and get on with some cards as July is a very busy month for birthdays in our family. Why don't you enter our 'Things with Wings' challenge, we always look forward to seeing what you've come up with just go here and entering is very easy. 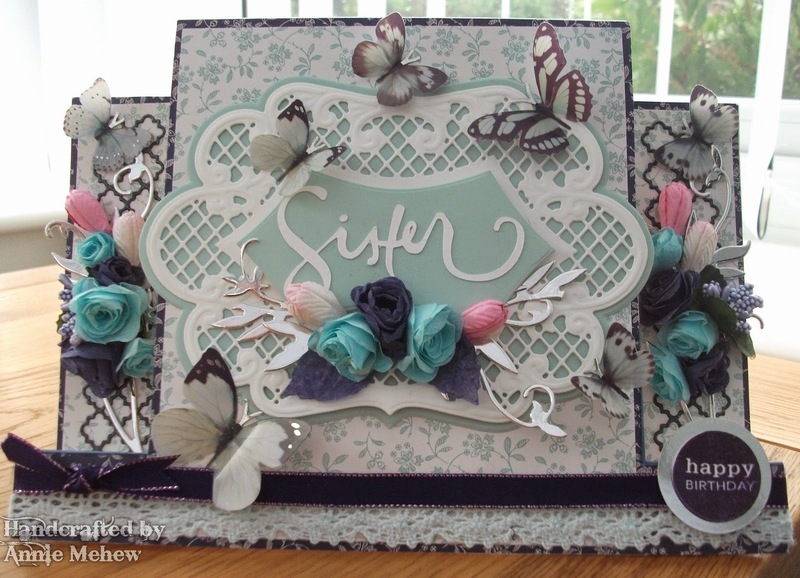 This is such a pretty card Annie and I love all your gorgeous embellishments - those butterflies are so lifelike! Another beautiful card Annie, the colours are gorgeous and I love the Marianne die you used too. Hi there Annie...hope this finds you well!! Your card is so GORGEOUS...I love the soft colours matted on the darker paper...everything just POPS!! Your butterflies are FABULOUS!! Take care and have a wonderful weekend! !